Due to the increasing adoption of computers and networks, web-based learning (e-learning) has become more feasible and acceptable within the worldwide (De Moor, 2007). The Web, as an essential means of supporting teaching and learning, has become an important application in the field of tertiary education. 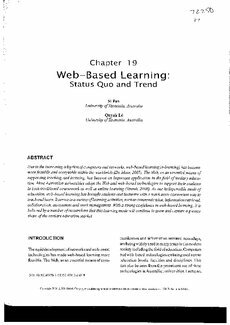 Most Australian universities adopt the Web and web-based technologies to support their students in both traditional coursework as well as online learning (Straub, 2008). As one indispensible mode of education, web-based learning has brought students and lecturers with a much more convenient way to teach and learn. It serves in a variety of learning activities, such as communication, information retrieval, collaboration, assessment and work management. With a strong confidence in web-based learning, it is believed by a number of researchers that this learning mode will continue to grow and capture a greater share of the tertiary education market.